Earlier this year, when Epic Games revealed Epic Citadel -- a tech demo for its Unreal Engine running on Apple’s mobile iOS -- heads turned. It was a technically impressive piece of software, demonstrating some truly incredible visuals on Apple’s mobile devices. It’s certainly a hell of a hook, enough to get the folks at Cupertino flaunting the software every chance it got, but gorgeous visuals don’t make a great game. 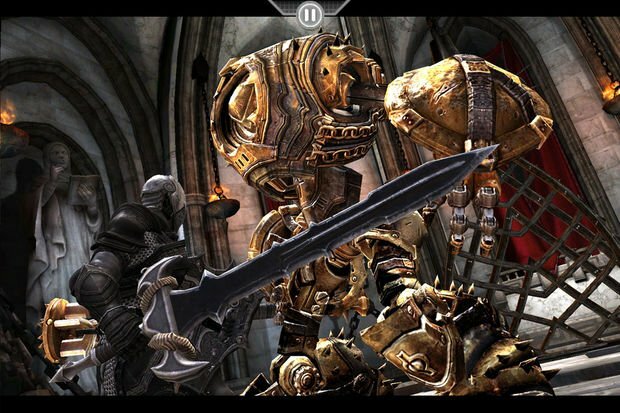 Fortunately, the first iOS title to utilize the Unreal Engine, Chair Entertainment’s action-RPG Infinity Blade, has the gameplay chops to match. Infinity Blade puts players in the role of an unnamed knight determined with besting the ominous and powerful God-King, a mysterious emperor that evidently sits on a throne all day waiting for warriors to challenge his dominion. Okay, make that “knights,” plural -- Infinity Blade’s “story” (if you could call it that) unfolds across the span of hundreds of years, with players working through “Bloodlines.” As the game begins, you’ll step into the armor of a low level fighter, working your way from the gates of the castle to the throne room, besting guards -- warriors, assassins, massive trolls -- in the process. Your first fight with the God-King will end in your execution -- you simply aren’t equipped to conquer the formidable monarch. At this point, the game will fast forward some 20 years ahead, where you’ll begin the next “Bloodline” as the son of the fallen warrior, determined to exact retribution for your father’s death. This second time you will fail, as you will the third, fourth… you get the idea. Infinity Blade is a game that’s all about character progression, as your stats and armor will carry over from bloodline to bloodline as you repeatedly try to crush the seemingly unstoppable king. Within the first 20 minutes, you’ll have essentially seen everything the game has to offer to you in terms of what you’ll be doing and in what order you’ll be doing it. Fortunately, Chair has built an enjoyable, addictive gameplay mechanics into Infinity Blade. 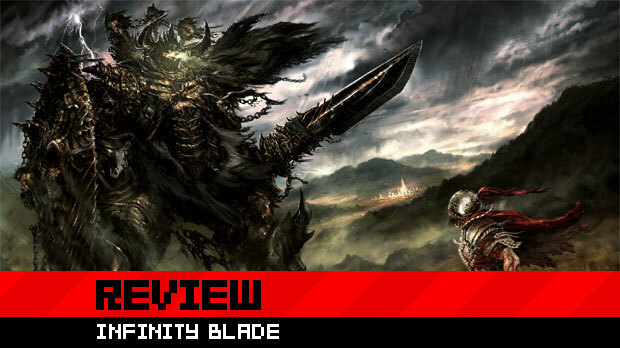 Married with the role-playing game-like character development, Infinity Blade manages to sidestep what could have been a monotonous catastrophe. Unlike the Epic Citadel demo, movement throughout the God-King’s fortress is extremely limited. Points appear on the screen indicate where you can move, and simply tapping the screen will take you in that direction. You can look around freely, finding out-of-sight loot, but that’s as much freedom as you're given. While much of the loot (in the form of sacks of coins or item-carrying treasure chests) is mostly randomized throughout each bloodline, the movement through the citadel isn't really. After a few plays, where you’ll go and your movement choices become second nature. As you move through the environment, you’ll invariably be met with enemy resistance, and that’s when the real meat of Infinity Blade rears its head -- the combat. Battle can easily be described as a more freeform version of Nintendo’s Punch-Out!!. You’ll tap the sides of the game screen to dodge left or right, or hold an on-screen shield icon to block incoming attacks. Slashing with your weapon is done with the swipe of a finger, the direction of which will result in a different angle of attack. If your first inclination is the swipe wildly on the screen, don’t bother, as enemies will simply block your attacks. Instead, it’s about finding patterns, swiping when there’s an opening, or even matching timing and slash directions to successfully parry an attack. Unlike Punch-Out! !, however, the characters you’ll encounter don’t hold to the same kind of patterns as Nintendo’s pugilists. The characters you’ll face are each unique in their own ways, be it in their armor or weapon of choice, but Infinity Blade doesn’t have its Bald Bull. Instead, you’ll be faced with “classes” of characters, each which have their own attack approaches, strengths, and weaknesses. For example, the larger troll-like characters tend to be slower and more powerful. Instead of mirroring Punch-Out! !’s puzzle-like pattern battles, you’ll have to reply more on quick thinking and reflexes as opposed to memorization. While the combat isn’t particular deep, it is extremely satisfying, thanks to extensive player progression and items. As you complete battles you’ll win experience points, and as you level up you can increase various skills, like strength or speed. You’ll also be able to find and equip a substantial amount of unique armor and weapons which you can “master” in the game through usage. Some items will even grant you with magic abilities, which can be activated and cast by drawing a symbol on the screen with your finger. Because battles are designed to be quick, punch experiences, leveling up and earning news items becomes almost like a drug; it’s easy to get wrapped up in an addictive “just one more battle” rhythm. It doesn’t make that much sense to harp on how wonderful Infinity Blade looks, because that much is obvious. It’s some jaw-dropping stuff, for sure. View the screenshots scattered about this review and know that your eyes are not playing tricks on you -- the Unreal Engine is doing this on your iDevice, and it isn’t even breaking a sweat. 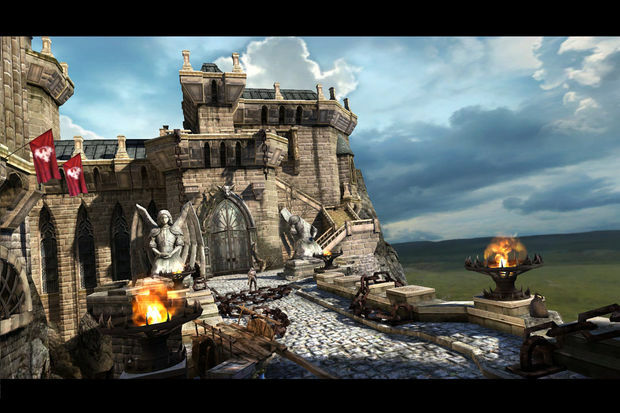 If you’re looking for a game to rub in the faces of your Android, Blackberry, and Windows Phone 7 owning buddies, look no further than Infinity Blade. Thankfully, Infinity Blade doesn’t rest on its good looks. Sure, it’s not a massive, open-world, but instead a tightly guided series of intense battles coupled with some seriously addictive character progression. 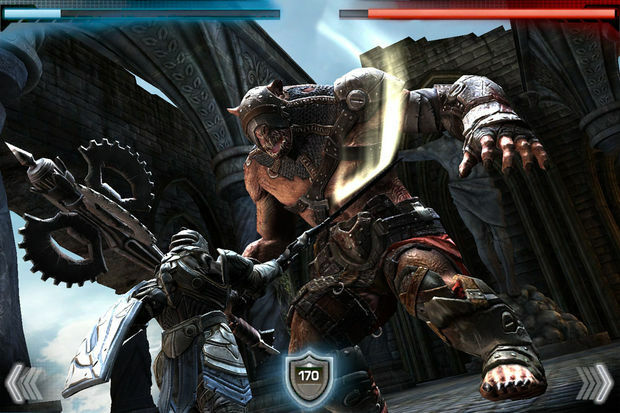 As a showpiece for the power of your iDevice, Infinity Blade is a no-brainer. Bonus: despite its repetitive nature, there’s a great game under the hood, one that's easy to recommend.